Description: This is a customizable student progress report for teachers using the Illuminate Standards-Based GradeBook. Users can choose to include (or not include) different sections of the report. Purpose: To provide students, parents, and teachers with a detailed summary of a student’s achievement for each standard assessed in the GradeBook. Students, parents, and teachers can use the report to easily identify specific standards students have or have not mastered. Aggregated Standard Scores for each standard assessed in the GradeBook, based on the calculation selected by the teacher. The full text of each standard assessed in the GradeBook. An Overall Mark aggregating all the Standard Scores in the GradeBook, based on the calculation selected by the teacher. An Overall Trend chart displaying the trend in the student’s Overall Mark across each grading period. The Assignment Date, Assignment Name, Standard, and Assignment Score for each assignment in the selected grading period. Brief explanations for both the overall and standard calculation methods used in the GradeBook. Each section in the report can be enabled or disabled by the user before generating the report. The Overall Mark is color-coded, based on the teacher’s grade scale, and clearly displayed at the top, showing both the numeric score/performance level and the performance level text. The Overall Trend is displayed as a line graph. 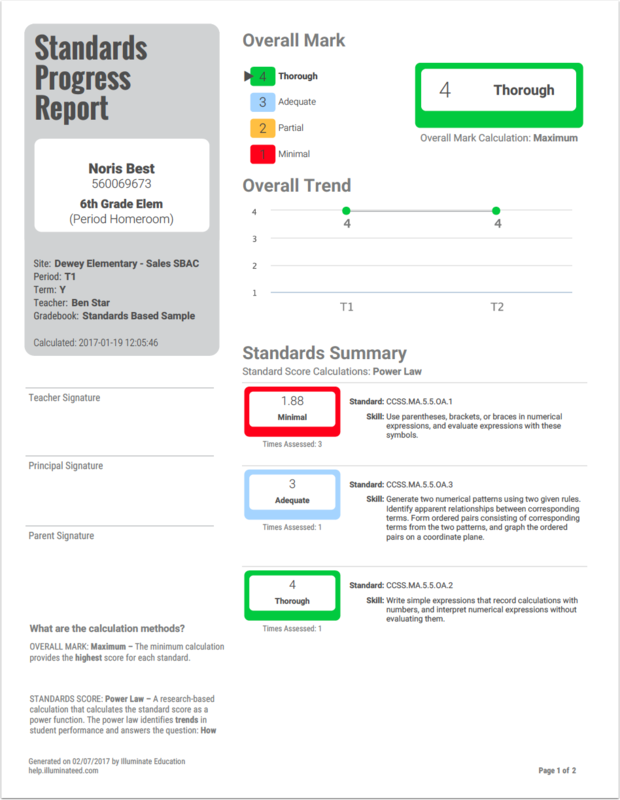 Each Standard Score is color-coded, based on the teacher’s grade scale, and clearly displayed next to the standard code and the full text of the standard. The standards are sorted by performance, with the lowest standard score displayed at the top of the list, making it easy for students, parents, and teachers to quickly identify the specific standards students need to focus on. The assignment details are grouped by standard and sorted by date, making it easy to see the longitudinal performance of the student for each standard.